Contact the Education Leadership program at edleprog@gmu.edu. Faculty and staff will answer any questions that you may have about your program or degree. Students in a graduate program must maintain a 3.000 GPA (B average). 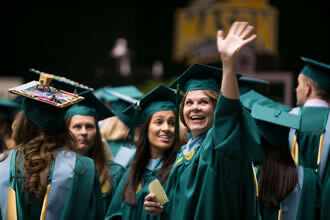 Mason allows six credits of C grades for graduation with a master's degree. However, EDLE students who receive a grade of C will not be recommended for state licensure. With advisor approval, up to 12 credits for the master's degree and up to 9 credits for licensure course work may be transferred from George Mason Nondegree or another accredited institution. Credits must be less than six years old, at the graduate level, and graded (grade of B or better, no pass/fail, audit, school district professional development courses, etc.). Educational Testing Service - School Leaders Licensure Assessment (SLLA).